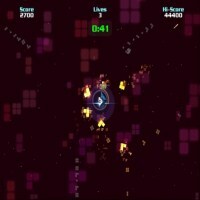 Unlike most space shooters, Trapped is simply a tad bit confusing. The game doesn’t just rely on you killing the enemy, you have to execute some special action before you can successfully eliminate them, protect your ship, and make a clean getaway. The game was created by Wiebo de Wit and was released just a couple of weeks ago. It’s still currently being updated for any new bug fixes and other improvements that can be done. It’s a cool shooter game though that’s perfect when you’re on break. Trapped places you in control of a ship. Your mission is to protect the portal from enemy ships that are closing in. Of course, it doesn’t stop with you blasting the enemy away. You have to break the yellow nodes and take out whatever’s inside, then drag this core into your portal to go ahead and power it up. To top it off, you have to do all this and leave the dimension before your time expires. For game controls, you can configure the settings to conform to the PC instead of the gamepad (default.) For normal PC settings, you can use the left mouse button for shooting while the right one can be used for dragging the node to your portal. You have to keep in mind that in case a yellow node manages to get really close to your portal by itself; you’ll have to destroy it instead. Overall, the game is pretty good. It’s not a complete breakthrough but it is quite entertaining while it lasts.